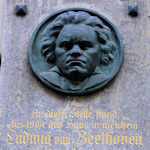 Anyone wishing to pay homage to one of the greatest composers of all time can visit Beethoven’s grave in Vienna. The location is beautiful, and you can almost hear the music in the air. Ludwig van Beethoven had the dubious pleasure of three burials. He died on the 26th of March, 1827 in Vienna and was buried a couple of days later in the Währinger Ortsfriedhof (a cemetery in one of Vienna’s outlying districts). Then in 1863 the authorities decided to repair his burial site. They exhumed the body and put it in a new and better metal coffin before burying him again. Unfortunately, the cemetery shut in 1873, eventually converting to a park in the mid-1920s. In the meantime, it was decided to move Beethoven’s remains to a better site. So in 1888, he was dug up again and reburied in one of the honorary graves at the Zentralfriedhof, Vienna’s main cemetery. Third time lucky, one might say, as he’s been left to rest there since. Schubert suffered the same fate, but at least both fared better than Mozart. The location is astonishingly peaceful and, dare I say, beautiful. The grave sits among flowers, shrubs, trees and greenery. In spring or summer, you can bask in sunlight, close your eyes, and seem to catch the sounds of a piano floating through the air. The Zentralfriedhof is a huge site, but Beethoven’s grave resides among a cluster of famous composers in one of the areas reserved for honoured “guests.” On cemetery maps, it’s marked as Grave No.29 in Group 32a. You can find it very easily if you enter the cemetery through the second (i.e. main) entrance which is called Tor 2. Go straight ahead through the middle of the stone arcade, heading towards the large church. Just keep your eyes open to the left to spot the grave. For directions to the Zentralfriedhof, see the main cemetery article.